As you get ready for the big game, this recipe will definitely be a PARTY FAVORITE. Vegan. Buffalo. Wings. I teamed up with my pals over for Sprouts for this recipe. Thanks Sprouts - now I can finally eat again :) I really love this store (I do not work wth brands I don’t use). Why do I like this store? They have so many VEGAN OPTIONS. They also have better prices than a lot of other stores with similar foods, and not that this applies to this post but they have the world’s best corn tortilla. If you love me, go support Sprouts. I recommend them for your go-to vegan shopping! Okay enough ad … onto the MEAT (vegan meat). 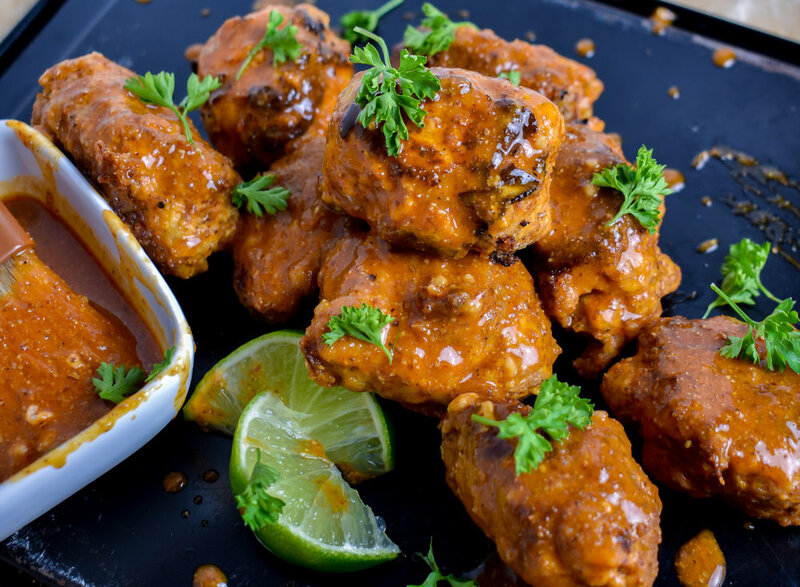 Now, I am sure you’ve seen a vegan wing recipe before. 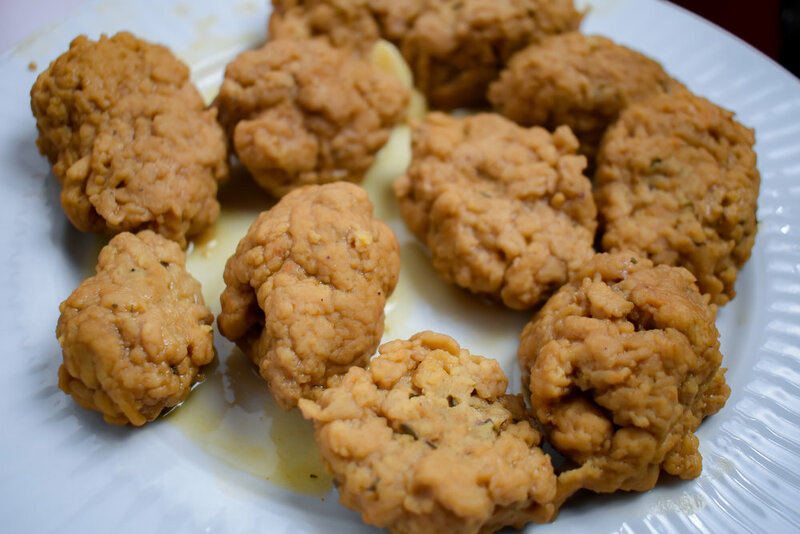 Good news, we ain’t coating cauliflower in batter and calling it a wing. 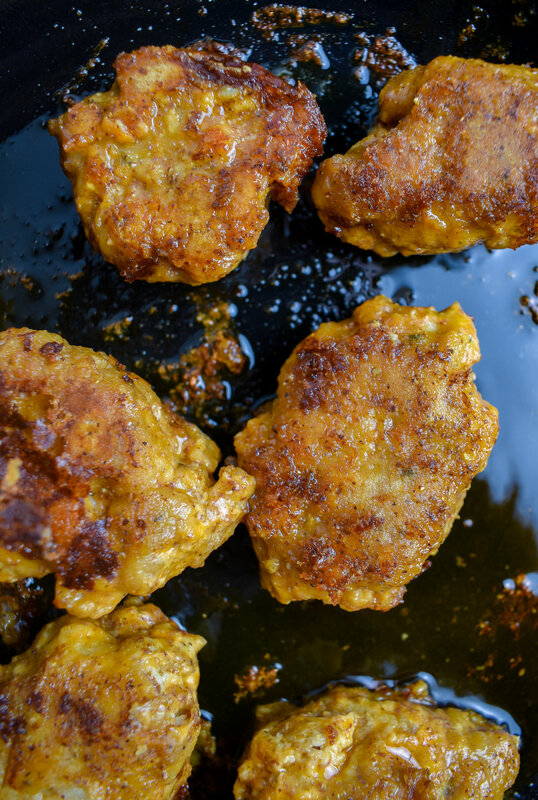 Nope, we are using a from scratch seitan recipe that will absolutely knock your socks off and then dousing it in a thai spicy buffalo sauce that will kick in your teeth and steam out your ears. Okay, it isn’t that hot, but its YUM YUM YUM good. 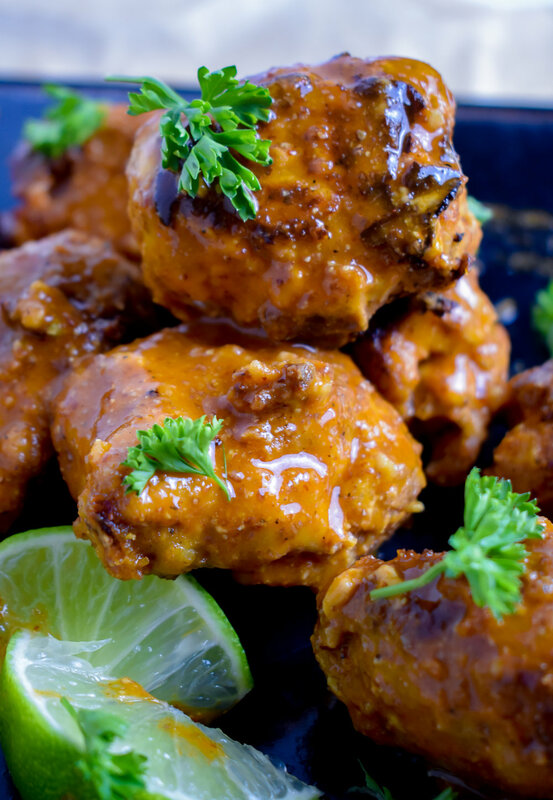 So not only is this a great wings recipe its also an amazing chicken seitan recipe that you’ll love!! After we make the seitan and buffalo sauce we batter them in the sauce and pan fry then douse in more sauce. Uh…yum! One thing about this recipe is that I do a use a stand mixer at the beginning. If you have one, use it. If you don’t, I have alternative directions below!! Cutting Board . Medium Cutting Knife . Measuring Cups . Measuring Spoons . Kitchenaid Mixer . Large Boiling Pot . Dough Hook + Paddle Attachments for Mixer (optional) . Mixing Bowls . Whisk . Large Frying Pan. Mix flaxmeal + water. Set aside to form flax egg. 1. Using a stand mixer + paddle attachment, mix together the 1 cup vital wheat gluten, 3 tbl brown rice flour. 1 tbl nutritional yeast,1/2 tbl onion powder, 1/2tsp dried thyme, 1/2 tsp dried basil, 1/2 dried oregano, 1/2tsp smoked paprika, 1/4 tsp coriander, 1/2 tsp Old Bay, 1/2tsp garlic powder, 1/4 tsp white pepper, and 1/4 tsp salt with a paddle attachment on low speed until well mixed. If no stand mixer, mix with a wooden spoon till well blended. 2. 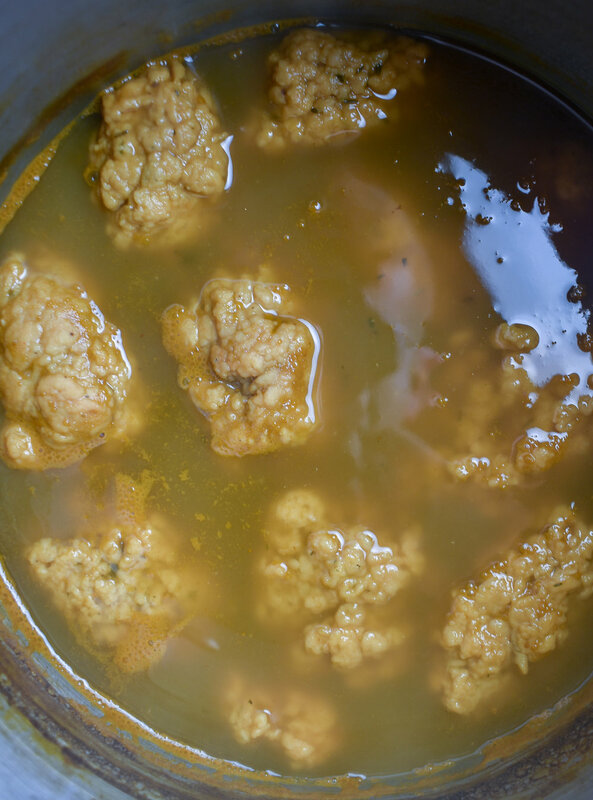 While mixer runs on low, add in ½ cup warm water + 2 tbl liquid aminos. If using bowl, continue stirring with wooden spoon while adding water + aminos. Next, change the paddle for the dough hook on stand mixer if using. Run the dough hook on low for 10 minutes to knead the dough, add in another 2 tbl of warm water, and run on low for another 10 minutes. If not using a stand mixer, once well mixed with a wooden spoon (about five minutes mixing liquid with dry), pour the mixture onto a flour-lined surface. Knead the dough with hands for about 8-10 minutes until it becomes elastic-like and can be pulled apart without breaking. 3. Once done with mixer (the dough should be super elastic-like) or kneading, form into 10-12 small wings. 4. Bring the 8 cups of broth + 3 garlic cloves to a boil over medium-high heat. Add the wings to the boiling broth and reduce heat to medium. Simmer for 60 minutes until wings double in size. 5. 1. While the wings cook, mix together the thai buffalo sauce (all ingredients). Additionally, in a shallow bowl or plate, mix ½ cup brown rice flour, ½ cup AP flour, and 1 tsp black pepper. Once wings are done cooking, drained, and cooled for a few minutes, dredge in the flour/pepper mixture until well coated. Set onto a plate. 6. 1. Add 2 tbl of vegan butter to a large frying pan. When the butter starts to pop, dip the dredged wing in the thai buffalo sauce and lay on the pan. Repeat until all wings are complete (add another 1 tbl of vegan butter if repeating). Flip after 1-2 minutes when the wings start to brown. I like a little burn on my wings as it adds a nice smoky char. Once browned on both sides, set on paper-towel lined plate. 7. To serve, brush on the buffalo sauce on all wings until gone. Serve warm!